So what is malnutrition anyways? Malnutrition and starvation: what's the difference? Malnutrition is when you don't get enough nutrients. It makes your body more susceptible to disease. The effects build over a long period of time. Starvation is the extreme, rapid result of severe hunger. If not stopped, it ends in permanent damange or death. Fill two bags with sand - 15 pounds in the first bag and 30 pounds in the second. 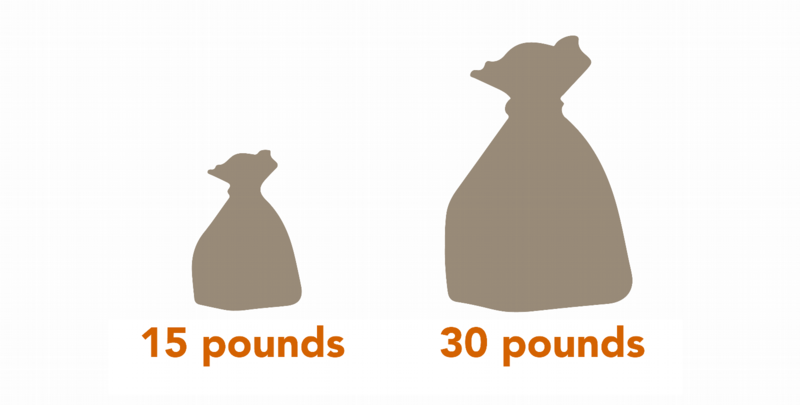 The smaller bag represents a malnourished 3-year-old, while the larger bag represents a healthy 3-year-old. Take turns picking up each bag and experience the difference. Keep the bags in your classroom, on display or around your event to help give people a perspective on hunger.